Sold by AU-SAUNORCH and Fulfilled by Amazon. Gift-wrap available. 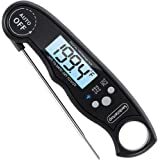 [ EASY TO USE ] SAUNORCH Digital Thermometer with foldable 4.6" food grade stainless steel probe and auto-on/off function,unfold the probe to turn on,fold the probe to turn off, ºF/ºC switchable, 10 Minutes Auto-off. 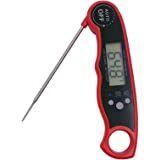 The Meat Thermometer can be attached to the refrigerator and other steel surface with its inside magnet. You can also hang it on a hook with the big hanging hole,convenient for use,storage and carry. 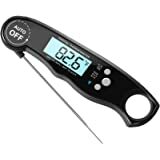 Easily to check out the Max and Min temperature when cooking. 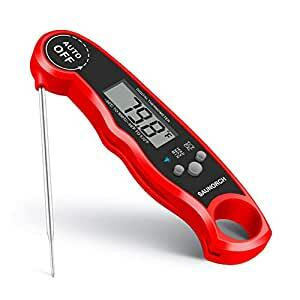 [ BACKLIT LCD DISPLAY ] Press the backlight button, the SAUNORCH BBQ Thermometer will show the temperature clearly in the evening, the screen will light for 5 seconds. It makes barbecue and picnic easier and more convenient at night. 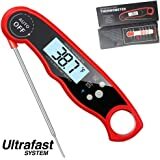 [ IP 67 WATERPROOF & DURABLE ] The waterproof function makes it perfect for Liquid, Food, Meat, Candy,Cheese, Chocolate Coffee, Milk and Bath water temperature.You can wash the whole thermometer under running water without fear.The thermometer case made of strong ABS plastic material, it can withstand accidental drops or other impact accidents, it's durable and resilient. 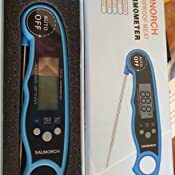 [ 100% MONEY BACK and LIFE TIME WARRANTY ] SAUNORCH Cooking Thermometer qualified with CE, FDA, RoHS certification,and we guarantee 100% money back if you are not satisfied with it,sharing it now to your family and friends. 1.Do not touch hot probe with bare hands. 2.Do not leave the thermometer in the oven while cooking. 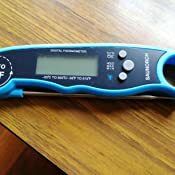 3.Do not completely immerse the digital thermometer in water for minutes. 4.Please wash the metal probe in soapy water. 5.Please clean the thermometer by hand or using water. Please make a cup of ice-water by filling a cup with ice and topping it off with water, and insert the probe so that it's touching the ice (make sure the probe touches the ice under water). When the temperature reading reaches a stable temperature, hold down the “CAL” key for 5 seconds. After 5 seconds, the display will flash “CALL” on the screen, and will flash the temperature reading. 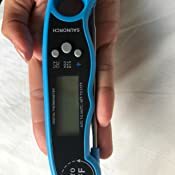 Use the C/F key to increase the temperature reading or the “HOLD” key to decrease it until you reach 0°C or 32°F.Note: Make sure that the ice water has time to reach its coldest and that the probe is touching the ice. Otherwise, you may get an "ERR" message if the temperature is not at freezing. 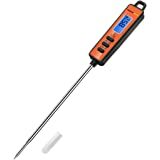 The thermometer can help me cooking the food, not only include the meat (pork, beef), but also coffee, etc. To be honest, the one increase the feasibility with reference to cook. 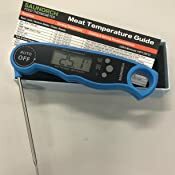 Very easy and simple to use, can be use for so many purpose, i even use it to check the air temperature. It also have light function, very convenient. Also simple function allow me to change temperature from FC to C.
Extremely easy to use. I get my answer in seconds! It’s really helpful to do the cooking, and the quality is good. 5.0 out of 5 starsHandy and accurate !